I went for a ride with dad today, and we stopped to pick up mom, then went to a new place I have never been to before. There were lots of other furry smells. I was real nervous, as sissy wasnt with us. A nice lady came and told us to follow her, then they walked me toward a big shiny thing. I didnt like it at all, so I just layed down in front of it. mom is always telling me to stay, so I decided to do it before she even said it. But I guess they didnt like it, so dad lifted me and put me on it. I didnt like it one bit. They said something about me weighing 132 pounds. My leggie doesnt feel very strong so I walk funny now. We went into a room and mom and dad sat with me, so I laid down and waiting for I dont know what. A man finally came in and rubbed me all over. I kinda liked that, and wagged my tail at him, then he took me to another place and layed me down and pointed things at me. Mom and dad didnt get to come. Then they poked me with some sharp things, and some red stuff came out. then I heard the man talking to mom and dad through the door. Im not sure what it all meant, but mom's eyes were wet when I came back to her. After that, they took me back to mom and dad. I was very glad to see them. Mom will tell you the rest. I am terrified, but trying to be hopeful. We did blood tests to see if it is one of the first 2. If they are ruled out, then we have some tough decisions to make, which I cant even fathom thinking about. Dr said to not walk him right now, and sent us home with antibiotics, antiflamitories, and pain killers. We wont know for 1-2 weeks. I just tear up each time I imagine not being able to walk him. I may take him for a little walk to the park across the street in the morning, so he can sit with me, and get a chance to smell stuff. Oh this is tough-- Keep my Max in prayers- Much appreciated! Poor Max. It must be so hard on him to not be able to go for walks with you. We will be purring and wagging our tails for Max. We hope for the best. I'm sorry to hear your leg isnt behaving itself. My mom was very sad when she read your blog tonight...she knows from experience how hard it is to wait for test results. 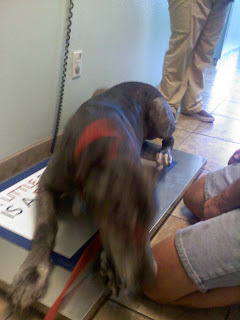 She went thru the same thing with her 2nd dane-boy, Tyler. I'll be crossing my paws for you and Mom said she'll say a little prayer for you tonight. We really hope you don't have the big C Max. Oh dear Max, Those sound scary but I am guessing the first 2 are better than the third. We have every paw finger and toe crossed that it will be ok. In the mean time, I know how you feel not being able to walk him for now. That is what doggies love best. Moose went 3+ months with no walkies and confined to a pen and he shocked me with how well he took it. Just find other things to stimulate him. Even the front yard may be far enough to take him to get the new smells without making his paw worse. I found new toys brought him a lot of joy and distraction in that time. Please keep us posted on how you all are doing. sounds like a long wait but try not to get too far ahead of yourself and focus on what you know now. Oh Max! That is very scary news and two weeks is a long time to sit around and wait. I bet you will feel better with the medicines inside of you, but you need to rest anyway, OK? I think some ice creams would make everybody feel better right about now. I'm sending healing vibes your way! Pee S - my mom is wondering if your docs offered a bone biopsy? Also - they do an xray? I'll khross my paws and send LOTS of Sibe Vibes! We are sorry to hear about yer leggie. Try not to walk too much k? And yer mommy could use a kissy. ps. oh yeah our mommy said she said a prayer fer you. Mango spread the word to come and give some good doggie vibes. I don't have any Sibe Vibes, but you sure can count on lots of KYLIE Vibes being sent directly to you!!! Joey and Mango told us you were having some problems. We stopped by to wish you the very best outcome with your tests. Paws crossed for you Max! w00fs, me got u in me prayers and sending get well vibes to u..
Oh no! Poor Max!! I'm so sorry to hear this! We are keeping fingers and toes and paws all crossed for you! Max, the power of the paw is an amazing thing. I will think my very best thoughts for you. My Mom is praying for you. You will be ok. For now, rest as much as you can and I hope you get lots of treats to aid in your recovery. We are crossing all our paws and sending healing Aire-zen for you, Max! Now, use your "sad eyes" and make your peeps give you as many treats as possible! We have all our paws crossed for you Max. Get well soon. Mango asked us to stop by and we are glad we did!! Our happy thoughts and prayers are being sent Max's way!! Mango sent us over here, and we are so sorry that Max is going through this. Paws and ears crossed for your dear boy. I came here through Mango's blog. I LOVE great danes and hope one day to have my own. Hopefully the medicine makes your leg feel a bit better and the news is good. Than you can all celebrate with a long walk to the ice cream store. I came from Mango's blog to give you good healing vibes. We are sorry to hear about your health problems. We hope that the medication you are taking makes you more comfy and that they determine what you have and can treat it.